Anyway, today we’re jumping right into another of them monthly interviews. 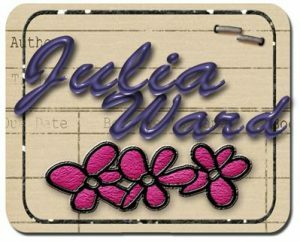 Today’s interview is with another one of vict- …I mean esteemed guests, Julia Ward. Ugh. For me the hardest part is feeling like no one’s going to read it. It’s something I think all of us struggle with as human beings, not just writers. Everyone’s going to see me as a fraud. So the most difficult part of writing anything, for me, is just making myself write it and get it out there even though part of me insists that no one is going to read it let alone like it. I do the first few run-throughs, then I bug a writer friend like my interviewer, to run through and catch the things I’ve gone blind to. Do you think that giving books away free works and in that case, why? I’ve been struggling with this question. Maybe not free exactly. Maybe a coupon code to make it free if you sign up for email or are a part of a group. Give it away as a perk for something. I have a book I got as a freebie on Amazon when it was first released – Actually, I have a few. I haven’t read any of them. Free is frequently equated with no value. So give it away totally free? Maybe on the release date. But after that, there needs to be value somewhere. I’m hoping that made a little bit of sense.